Standing next to the old Greenville County Courthouse in downtown Greenville is the iconic Poinsett Hotel. 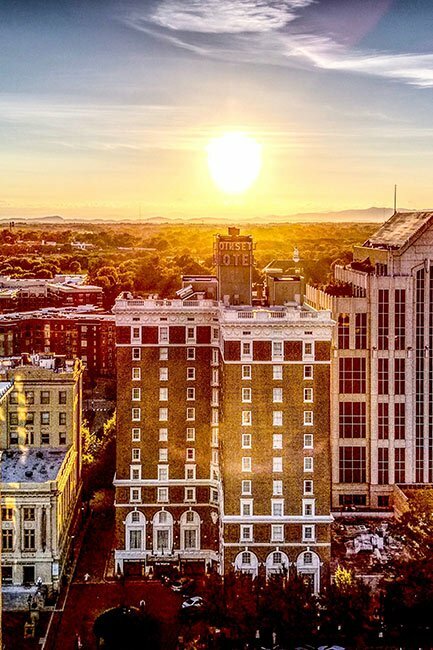 One of the first high rise buildings in the Upstate city, the hotel was built in 1924, replacing the Mansion Hotel that had stood on this site since 1824. The $1.5 million hotel opened in 1925 and was named in honor of Joel Poinsett, a South Carolina statesman who served as Director of the South Carolina Board of Public Works from 1818 through 1820. Poinsett also sat in the United States House of Representatives from 1821 through 1825 and was a United States Ambassador to Mexico from 1822 through 1823. He introduced a native plant from that country to the United States, which is now named for him – the poinsettia. As a result of the hotel’s success, the Poinsett added 60 guest rooms in 1941, each with its own private bathroom. It thrived for another decade or so until motels came into fashion during the 1950s. 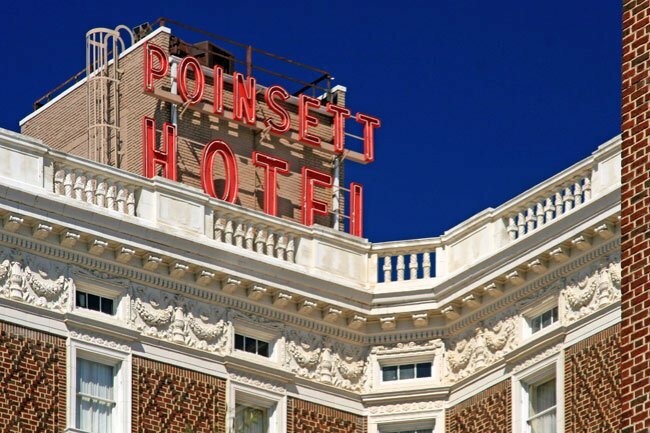 These less-expensive, bare-bones accommodations became popular with travelers and soon rendered fine hotels such as the Poinsett nearly vacant; in 1959 the Poinsett Hotel was sold to the Jack Tarr hotel chain. The Poinsett continued operations for the next decade, though much of its luster had faded. Beginning in 1971 the hotel changed hands several more times and eventually became a retirement home. The retirement home closed in 1987 as the result of foreclosure and lack of adherence to fire codes. The former grand hotel then sat empty until 1997, when it was purchased by Steve Dopp and Greg Lenox, owners of the Francis Marion Hotel in Charleston. The Poinsett Hotel’s new owners immediately began renovations on the historic building, which had become one of the Palmetto State’s most endangered historic buildings. The hotel was soon restored to its previous luxury, and in June of 2000 the hotel celebrated its 75th anniversary with a reception in the Gold Ballroom. 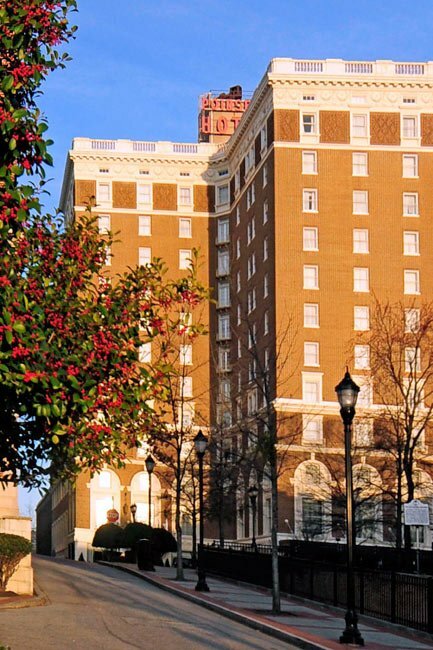 The following October the Poinsett Hotel officially reopened as the Westin Poinsett, once again relishing in the title of “Carolina’s finest.” Notable past guests of the Poinsett Hotel include Amelia Earhart, Cornelius Vanderbilt, Bobby Kennedy, and Liberace. The Poinsett Hotel was one of the first skyscrapers to be constructed in Greenville. Named after Joel R. Poinsett, the Secretary of War under President Fillmore, the hotel was built on the site of the Mansion House, an 1824 resort hotel. 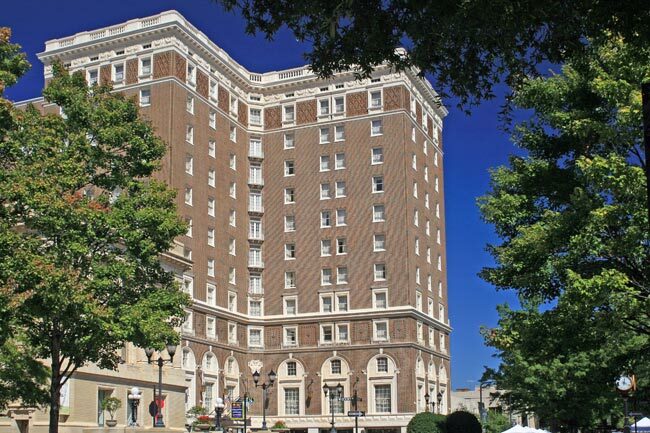 Built in 1925 at a cost of 1.5 million dollars, the Poinsett Hotel was designed by William L. Stoddard, a New York architect, and built by the J.E. Sirrine Company of Greenville. The Poinsett is a twelve-story skyscraper with a narrow rectangular plan and an L-shaped façade. The façade is composed in three parts: a base, an intermediate shaft, and a capital. The four-story base is highlighted by tall arched windows that span the second and third stories. A wide cornice separates the base from the unornamented shaft. A broad frieze with terracotta festoons and urns between small transom windows is above the capital story windows. A full cornice with dentils and modillion blocks surmounts the frieze. A balustraded parapet is above the cornice. 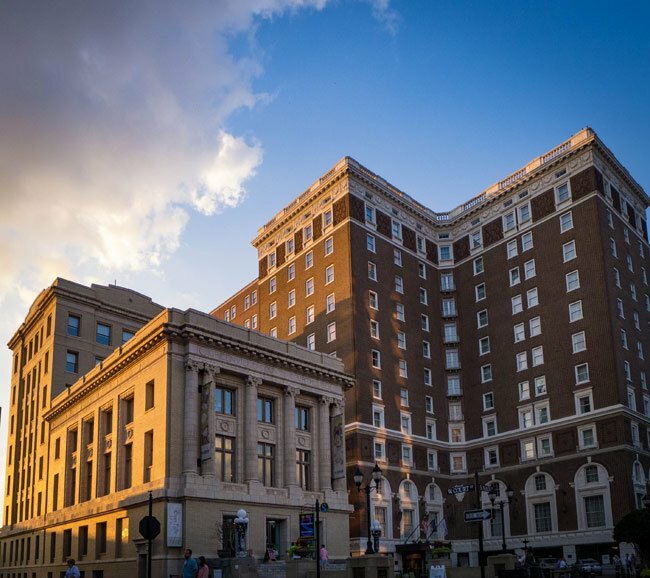 The Poinsett Hotel marks an era of Greenville’s building boom and growth in the 1920s. The hotel featured a ballroom, a convention hall, a main dining room, private dining rooms, a grill room, a lounge, eight to ten shops and stores, and 210 guest rooms, each with a private bath.